Swish! Click! Save a Life. #IBuckleUpMyFamily”, because I care… do you? 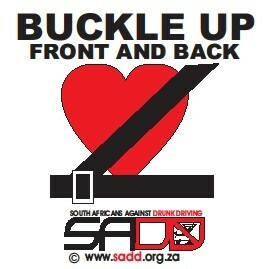 South Africans Against Drunk Driving (SADD) is pushing for more awareness around seatbelt use. We would like to involve you in helping to prevent the high number of deaths and injuries that occur on our roads. Together we can make a difference. According to World Health Organizations (2013) wearing a seat belt reduces the risk of fatality among front passengers by 40% – 50% and of rear seated passengers by between 25% – 75%. When it comes to child restraints, they reduce deaths among infants (under 3yrs) by approximately 70% and deaths among small children (3-12 yrs.) by between 54% and 80%. Spread the word on seat belt use by taking a photo of yourself (selfie) and your family and friends buckled up, in the front and back of the car. Tag #IBuckleUpMyFamily #WomansMonth and send your selfie to @SADD_SA on Twitter and Facebook and be part of the community that is helping #StoptheCarnage on our roads. Another idea is to stand at a robot or school gate for an hour in peak traffic in August 2016, with a #WomansMonth #IBuckleUpMyFamily because I care… do you?” poster that SADD can provide you with. When you get women in roles of leadership, we make things happen.